Some times slippery stairs are unavoidable, either due to aesthetic reasons, involved expenses, or inability to make repairs on rented property - unlike cheap rubber stair treads set, our Polypropylene fibre carpet surface with PVC backing offers an easy, elegant & cost-effective way to improve safety & comfort for humans & pets alike! 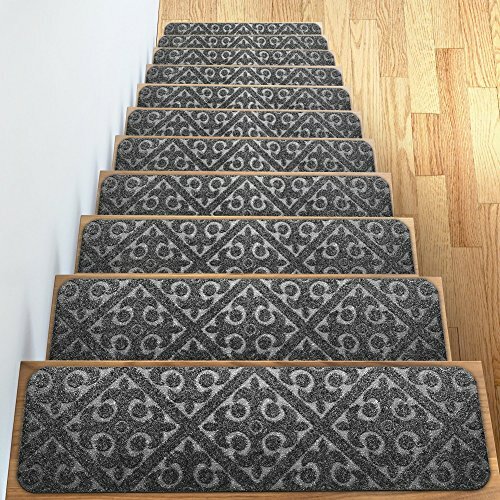 ORDER NOW & Get this incredible stair pads or stair carpet set Delivered to you in just 2-3 Days! INCREDIBLY SAFE carpet stair treads non slip rug 13 pc set can transform any slippery staircase treads into a slip-resistant surface, ensuring safety of kids, friends, family - be it hardwood or ceramics. PET-FRIENDLY wood stair treads carpet design offers desirable traction, encourages dogs & cats to confidently take stairs, muffles the sound produced with each step, while also PROTECTING STAIRS. EASY TO USE as these stair mats allows for effortless DIY installation using INCLUDED CARPET TAPE, can be easily removed while leaving NO RESIDUE behind, and is safe for vacuum or damp cleaning. PREMIUM DESIGN Soft & Comfortable stair tread or stair runner feels good on bare feet, and proves durable even for busy areas! CLASS & GUARANTEE - Cool grey color of stair carpet or stair runners goes great with any modern interiors, and with 100% RISK-FREE SATISFACTION GUARANTEE on this carpet treads, you have nothing lose. If you have any questions about this product by Elogio, contact us by completing and submitting the form below. If you are looking for a specif part number, please include it with your message.